Miami has become a “WRECKREATIONAL” diving destination that is destined to become another “Miami Vice” for visitors and residents alike. With it’s close proximity to the Bahamas and the warm blue water of the Gulf Steam, Miami enjoys beautiful diving conditions year round. With water temperatures from 70′ to 85′ and visibility often better than 75′, it remains a mystery why Miami has not been exploited like so many other dive destinations. Thanks to an aggressive artificial reef program, Miami has over 75 diveable wrecks within minutes from our Diving Center, or we can take you to North America’s largest living coral reef, John Pennekamp Marine Sanctuary, in Key Largo, just 75 minutes away. What am I Qualified to Dive? If you have not dove in the last 18 months, you must either take a Scuba Review class OR have you first dive guided by a current Dive Master or above. 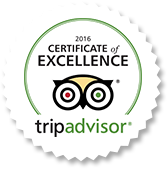 Guides are available for a fee, but must be booked in advance. It is important to log your dives so you can prove your diving experience and have the ability to dive on more of the great sites that South Florida has to offer. We start the PADI Advanced Class every Tuesday, Thursday and Saturday and it only takes 3 days to complete. If you have never dove in the ocean before we strongly recommend taking a “Discover local diving course” This one day class teaches you what ocean divers need to know. It is fun and there is no exams to take, just diving. Please call one of our instructors for times and availability. Here are some general safety tips when diving a wreck. Never anchor over a shipwreck. Anchors can damage wrecks, and have been known to pull wooden wrecks apart. Ideally, the anchor should be set down-current from the wreck. This way, divers can descend via the anchor line, and have the wreck in front of them. They can also use the anchor line to ascend when the dive is finished. Determining which way the current is flowing can be difficult. A small “wreck float” is an inexpensive and easy way to figure current direction. Simply tie a plastic jug and a four pound diving weight together with enough light-weight line to reach the bottom. If the wreck is in 60 feet of water, use about 80 feet of line. When the wreck is located with your fathometer, throw the jug over. Once the weight has settled to the bottom, it’s easy to see which way the tide is flowing by watching the jug. Most shipwrecks are located away from land and, as a result, are subject to larger waves than in sheltered waters. Simply getting back on board in high seas can be a challenge. Most wrecks are also located where some ocean current is flowing. If the current is moderate, it won’t be much of a problem. 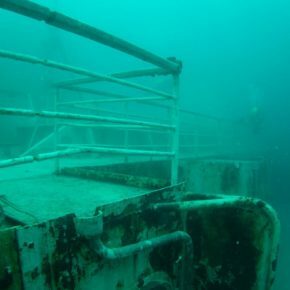 A wreck that has a strong current flowing over it can be very dangerous to dive, especially for novices. Do some research; if the wreck is known for heavy current, find another wreck. Poor visibility is a danger on some wrecks. Low visibility makes diving dangerous because it’s easy for diving buddies to become separated. A “buddy-line” is recommended in poor visibility. Surge, the back-and-forth motion of the subsurface water, can be a problem on wrecks in shallow water. Surge can slam divers into the wreck or into other things that can harm them. Wrecks with waves rolling over them should be approached with caution. 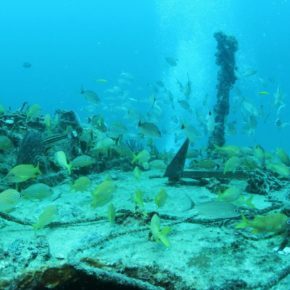 If a wreck has been down for a while, it has probably attracted an array of marine life. Underwater growth on wrecks in warm water usually includes fire coral and sea urchins. Take care not to touch or brush against such growth. Wrecks found off the beaten path will usually have barracuda and sharks. Barracuda attacks on humans are almost nonexistent. Since they are curious fish, do not wear jewelry, which they might mistake for a small fish. Much the same thing can be said for sharks. Don’t bother them, and they probably won’t bother you. Sharks, however, are considerably less predictable than barracuda, especially if large. Don’t take a chance. If there are big sharks around a wreck, find another place to dive. Normally, divers shouldn’t enter a wreck. Most divers can see all they want by cruising around the outside of it. 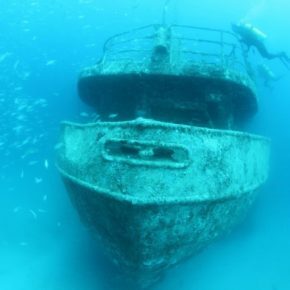 Entering a wreck has special dangers, and should be attempted only by experienced divers. For one, there is no “up” inside a wreck. If problems arise and a diver needs to get to the surface, he must first get out of the wreck. This problem also exists with cave and ice diving, both of which are dangerous. Another danger is getting trapped. It can happen for a variety of reasons which include having an old hatch cover or companionway door slam shut after it’s been disturbed, having old cargo fall, or getting lost inside the vessel. Getting trapped by falling cargo or an old hatch cover sounds far-fetched, but it has happened. Divers have died from such accidents. As for getting lost, the interior of most wrecks are pitch black and everything is covered with silt. Once a diver enters a room or compartment and moves around, the silt is stirred up. Divers can avoid becoming lost by tying a rope outside the ship and letting it out as they enter (by edwin). This provides something to follow back. Of course, divers should carry a diving light to see inside the ship. The bottom line is you’re never completely safe inside a shipwreck. A final danger often faced by wreck divers is that of depth. 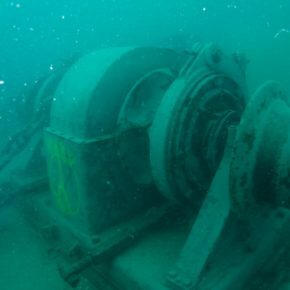 Most wrecks are fairly deep, especially the larger ones, and the deeper the diver goes the less time he has before decompression becomes a problem.